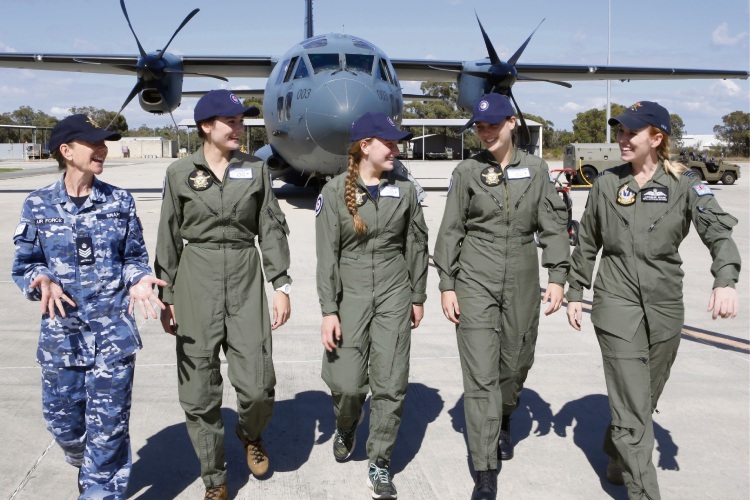 Flight Sergeant Michelle Snape, Ruth Staer, Jessica Read, Jorja DeMamiel, and Squadron Leader Jacqueline Killian at the Air Force Flight Camp for Young Women at RAAF Base Pearce. GETTING a taste of what a career in aviation would be like has given Jorja DeMamiel more reason to reach great heights. The South Lake teenager was one of 14 girls from across the state who last week took part in the Air Force Flight Camp for Young Women. Held at the RAAF Base Pearce in Bullsbrook, the camp was designed to give young women between 16-24 an opportunity to explore aviation and technical trade careers with the air force. Jorja (17) said she always wanted to join the Australian Defence Force (ADF) and that the camp gave her the added drive to complete her application for the air force. “I didn’t really have an expectations for the camp but I knew it would be good exposure to the air force,” she said. The Lakelands Senior High School student said programs like the flight camp were important for girls to be exposed to what careers in the air force would be like and made the application process for the ADF more comfortable. Flight camp officer-in-charge squadron leader Jacqueline Killian, from the ACT, said the camp encouraged young women to consider employment in military and aviation. “Currently less that 13 per cent of the aviation roles are filled by women, and the camp gives us an opportunity to show them that there are so many interesting and exiting jobs out there for them,” she said. During the camp, the young women got to fly in a PC-9A and a C-27J Spartan; experience a Hawk aircraft simulator; attend the No 2 Flying Training School; be mentored by industry experts; and participate in team building and public speaking activities.